Bajaj KTM, engaged in developing high-end bikes for the Indian market, would launch their bikes by the end of the year. We are at the top of the sports segment with Pulsar and want to focus on that segment. The company currently holds a market share of 27 per cent in the motorcycle segment and wants to increase it by three to four per cent by the end of the current fiscal. However, what is not clear as yet is the models and specifications of the KTM bike to be launched in India. 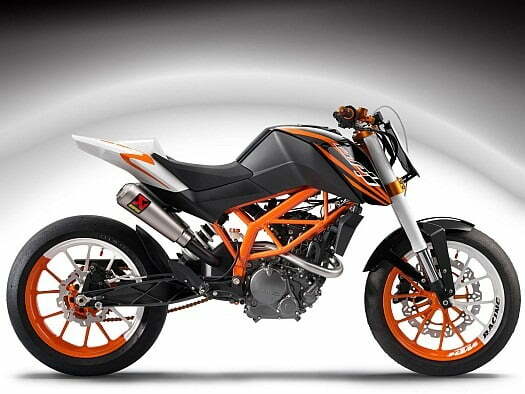 Most probably it will be the KTM Duke 200 – Details here. Earlier it was speculated that KTM will launch Duke 125 in India, which might not happen as the segment of 125 cc bikes is not targeted at enthusiasts in India as of now. In India, biking enthusiasts prefer going for higher powered and capacity engines to spend their energy and money on. The KTM Duke 200 CC will be one slot below the 250 CC segment which is mainly filled by Kawasaki Ninja 250R and recently launched Honda CBR250 R in India. The price of the bike is expected to be very competitive and may give a hard time to the competitors as most of the components of the Duke will be locally sourced from India to keep the price in favor of high sales.